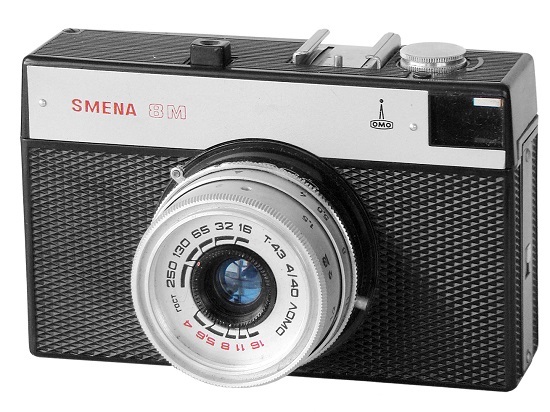 Doubtless the most popular Smena camera. You still can find it everywhere in post soviet area. 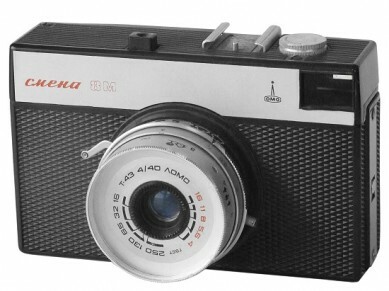 Camera identical to Smena-8, with new design and symbols in settings. No selftimer (although happened to see variant with one). Serial number engraved either on the bottom of shutter housing, either on camera underbody. Quantity: 21.041.191 units (with Smena-8 camera). Original price (in year 1986) 15 roubles. Thanks to Egidijus Girdauskas for camera #88519428 donation. PK3410. The prototype version of the particular camera. No serial number yet! 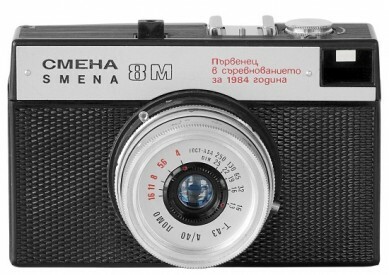 Single „Смена-8M“ name (in Cyrillic characters) written in red on white camera faceplate. An old design of lens faceplate, significations in GOST only. Different design of symbols, silkscreened on the lens. Frame counter completely painted in black (see picture below). There's no marks of nameplate fastening yet. Metal door's lock. An ultra rare to find nowadays. PK3415. Seems to be an earliest known productional version of Smena-8M camera. Almost identical to PK3410, but with serial number, stamped on the bottom of shutter housing already. An earliest so far known camera has s/n #000563 (Molotok 2010). 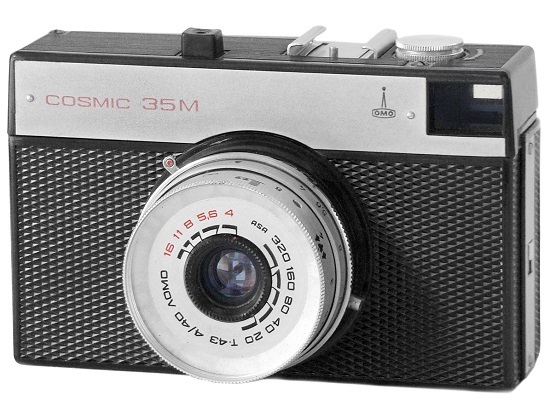 PK34510 - Smena-8M prototype camera. PK3420. An early and very uncommon version of the particular camera. New design of the nameplate (LOMO logotype moved close to name markings). An old design of lens faceplate, significations in GOST only. Aluminium frame counter with black-painted turning disk (see picture below). There's no marks of nameplate fastening yet. Metal door's lock. 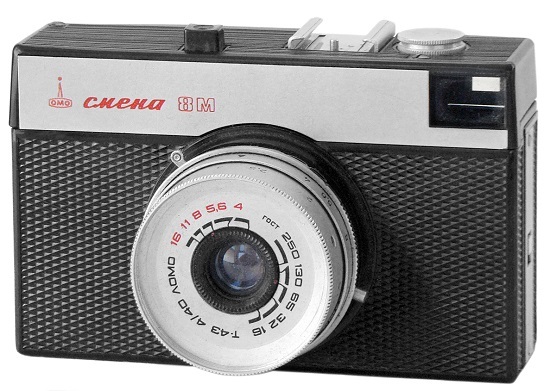 An only so far known camera has s/n #036286 (SovietCams). PK3425. This early camera identical to PK3415, but with aluminium frame counter as on PK3420. The same "SDELANO B CCCP" markings on the shutter housing. No otherwise different. PK3430. 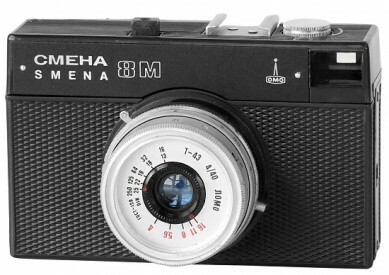 The most common version of early Smena-8M. Camera identical to K3415, but with visible marks of nameplate fastening (see picture below). Totally white frame counter already. An old design of lens faceplate, significations in GOST only. Metal door's lock. PK3435. 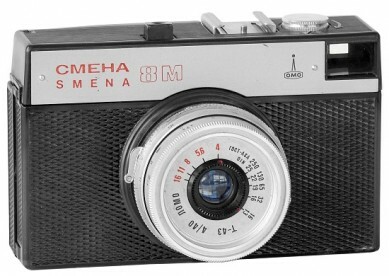 Camera identical to 1st version Smena-8M, but under export "SMENA-8M" name in Roman characters. An old design of lens faceplate, significations in GOST only. Aluminium frame counter with black-painted turning disk, like on PK3420 (see picture above). There's no marks of nameplate fastening yet. Metal door's lock. Investigated camera has s/n #136380 (SovietCams). PK3440. Camera identical to PK3435, but with visible marks of nameplate fastening. A big arrow sign embossed on the body's top plate. 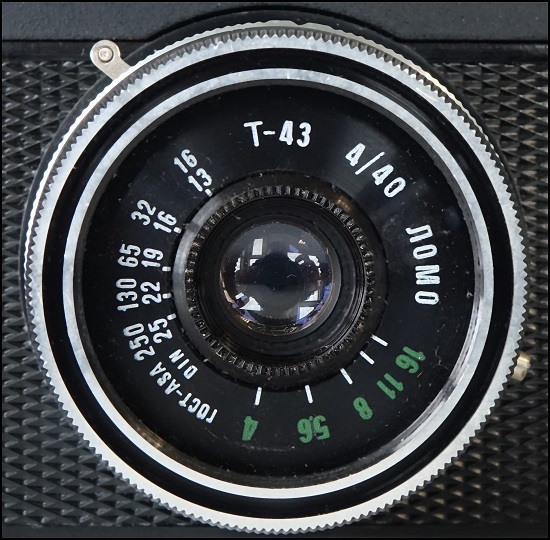 "MADE IN USSR" markings on shutter housing. PK3445. Quite common early version with visible marks of nameplate fastening already (as on PK3430, see picture above). Film rewind knob has black arrow, silkscreened on the top. No otherwise different. Investigated camera has s/n #597639 (SovietCams). PK3450. Very uncommon version, under export name "Cosmic-35M". Was intended for United Kingdom market. "MADE IN USSR" markings on the shutter housing. No otherwise different. PK3455. Less common to find early version of Smena-8M with binary name markings already. An old design of lens faceplate, significations in GOST only. Metal door's lock. An earliest so far known camera has s/n 000888 (eBay 2009). PK3460. The most common version to find. Binary name markings. 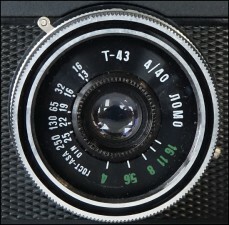 T-43 4/40 lens with GOST-ASA significations. Happened to see such a Smena-8M with yellow, green, red, light blue and dark blue bodies - all these are fakes. PK3465. Camera identical to PK3460, but with serial numbers, stamped on the bottom plate already. Mostly plastic door's lock. PK3467. Never seen before and ultra rare to find version of the particular camera. Totally black body. The binary name markings silkscreened in yellow. A very limited batch of these cameras were released in 1989 by LOMO. Announced in soviet literature at the end of eighties. PK3470. Still very common late version of the particular camera. These cameras come with shortened nameplate below the finder's window (see picture below). Signally changed construction of the camera. Plastic door's lock. Visually no otherwise different. investigated camera has s/n #90277161 (SovietCams). PK3475. Less common to find version with black faceplate and double name (+logo) in white. No otherwise different. PK3495. 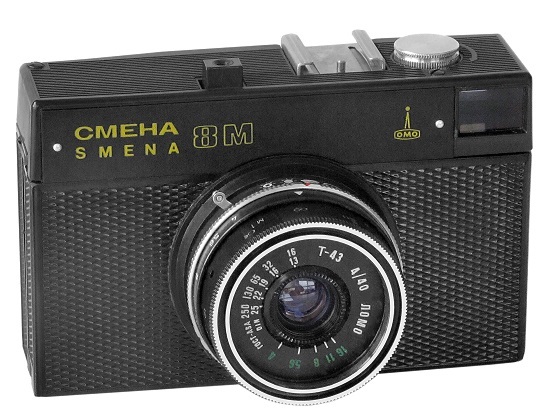 Identical to Smena-8M (3rd version), but binary name is silkscreened in black + red commemorative markings in Bulgarian „To the Winner of 1984 year competition“. As we can see, the mentioned version was used not for public sales. J.L.Princelle „Authentic Guide to Russian & Soviet Cameras: 2nd Revised Edition", 2004. J.Ryshkov "Brief History of Soviet Cameras 1929-1991", 1993 (russian edition).